Huge windmill blades are a common sight at the Port of Brownsville, attracted by the steady South Texas breeze and abundant available land. Windmill components are a common project cargo at the Port of Brownsville, with multiple and simultaneous wind energy projects utilizing the port’s expansive laydown assets. 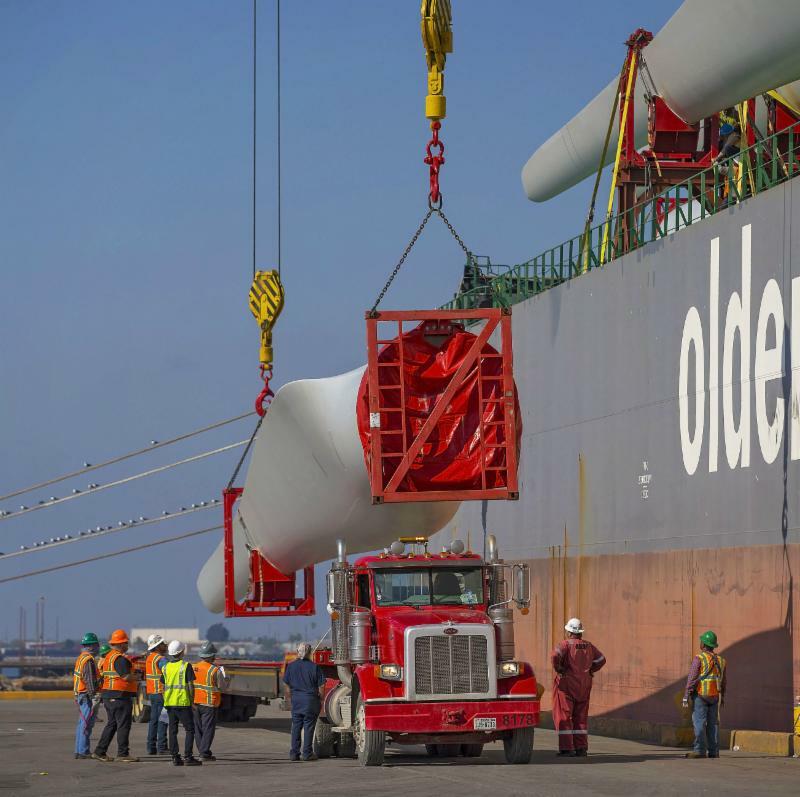 According to Steve Tyndal, senior director of marketing and business development, the port generally handles several major wind energy projects a year, and 2019 looks to be as successful as previous years. For the third straight year, Foreign Trade Zone No. 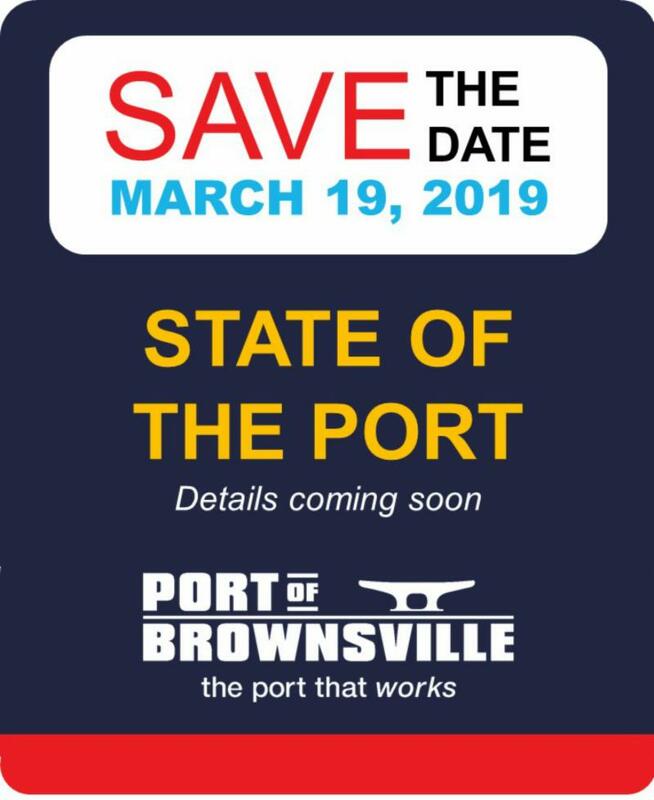 62 (FTZ) at the Port of Brownsville ranks second in the nation for the value of exports, according to the U.S. Foreign-Trade Zones (FTZ) Board’s annual report to Congress. The port’s FTZ reported more than $3.5 billion in exported goods in 2017. Additionally, FTZ No. 62 ranked 18th nationally for the value of imports totaling more than $3.6 billion. 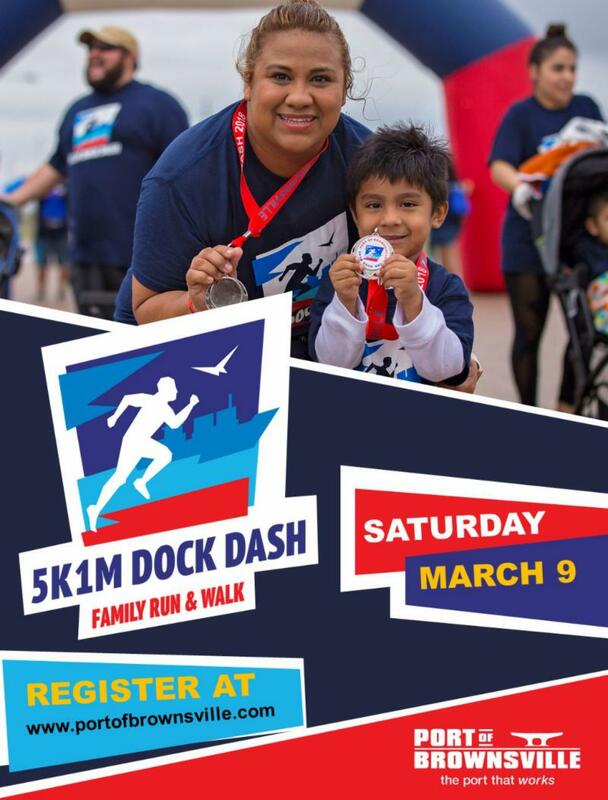 Pre-registration is open for the annual Port of Brownsville 5K1M Dock Dash for Saturday, March 9. The family-friendly run/walk event is free of charge. Pre-registered participants will receive a t-shirt while supplies last. From left to right: Port police officer Jorge Moreno, BND Commissioner Esteban Guerra, BND Vice Chairman Sergio Tito Lopez, port police officer Edgar Garcia, BND Chairman John Reed, port police Chief Carlos Garcia, port police officer Julio Romo, BND Commissioner John Wood, BND Secretary Ralph Cowen, port security officer Gabriel Lozano. 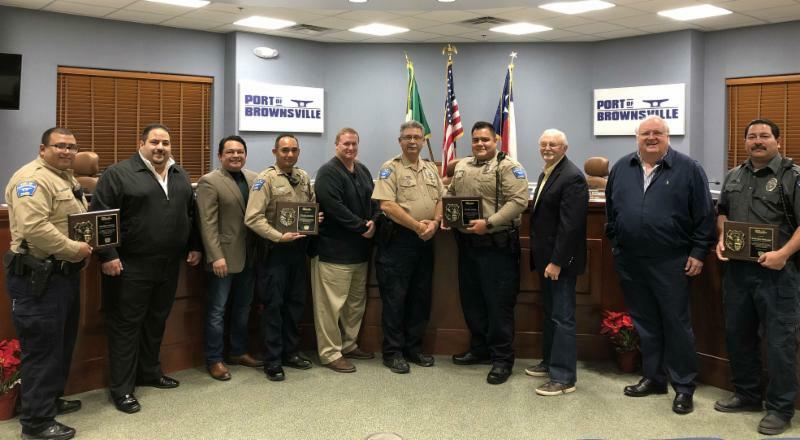 The Port of Brownsville recognized four members of the Police and Security Department for their outstanding service toward the port community. Security officer Gabriel Lozano and police officers Edgar Garcia, Julio Romo and Jorge Moreno received a plaque from Port Police Chief Carlos Garcia in recognition for their performance and dedication of their duties in 2018 as members of the police and security force. The recognition was made during the Brownsville Navigation District’s regular board meeting Jan. 2. Port of Brownsville Police Chief Carlos Garcia, right, administers the oath of office to officer Melissa Rosas during the BND regular board meeting Jan. 16. 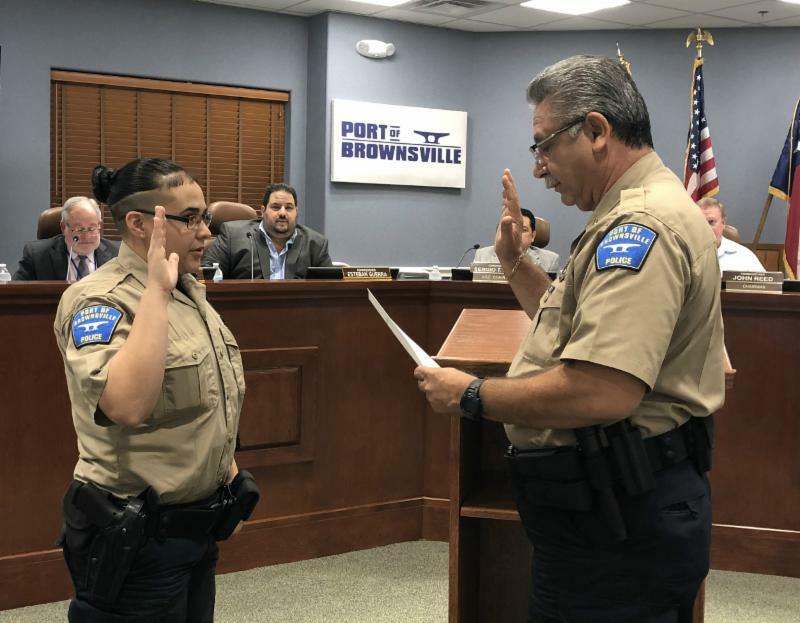 The Port of Brownsville added a new officer to its police force during the Brownsville Navigation District Commissioners regular board meeting held Jan. 16. Officer Melissa Rosas, from Brownsville, is the first female police officer joining the port's police department. Rosas received her peace officer certification from the Texas Southmost College Criminal Justice Institute. Prior to joining port PD, Rosas worked for the Los Indios Police Department and South Padre Island Police Department. NAFTZ Legislative Summit - Washington, D.C.
Daylight Saving Time Begins - Don't forget to move your clocks forward. 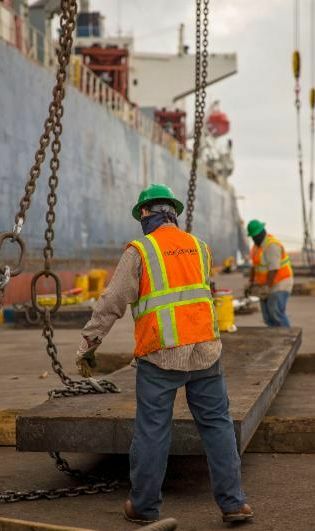 Gulf Stream Marine stevedores unload steel plates from a vessel at the Port of Brownsville. 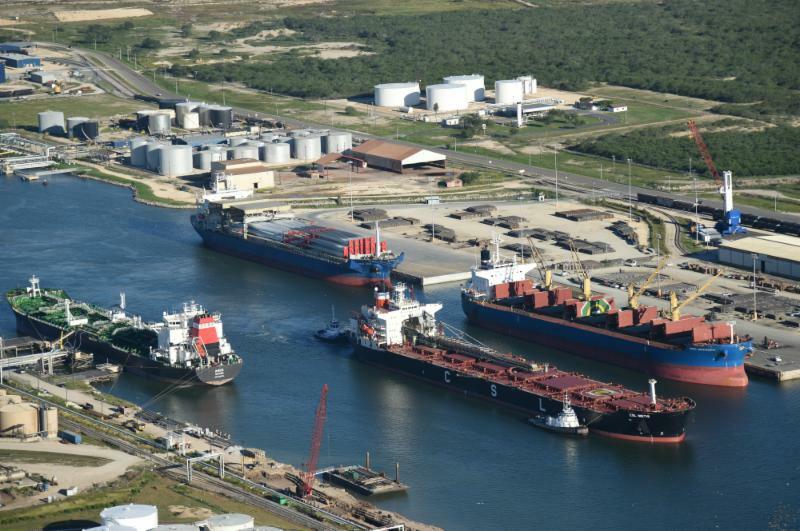 Gulf Stream Marine (GSM), Inc., a stevedoring company at the Port of Brownsville, received early February Signal Mutual’s Safety Leader Award in the Marine Terminals category. The award recognizes GSM as an industry leader in anchoring safety and health as a core value with a steadfast commitment to the prevention of workplace injuries and illnesses, in addition to promoting wellness and safety off the job and in the community. "The incredible team at GSM is very proud of this recognition and we are inspired to continue to pursue our safety journey with the same vigour and energy," said Kevin Bourbonnais, the company's president and CEO. 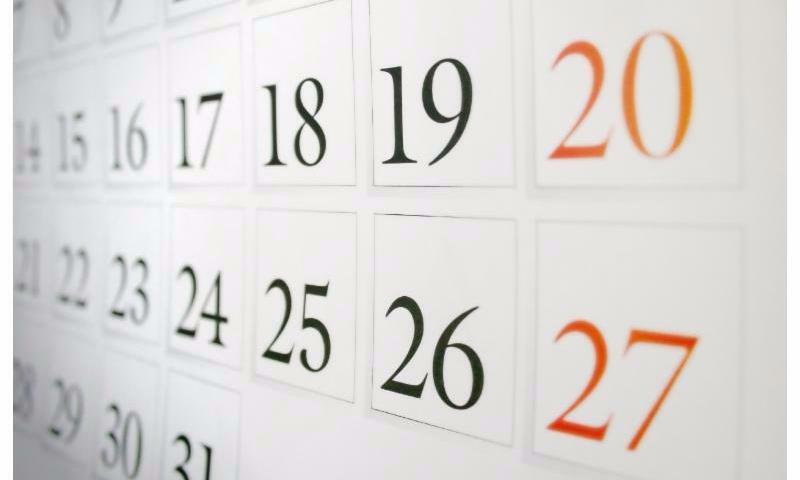 "Together, the GSM team makes health, wellness and safety a top priority every day. Our focus on injury and illness prevention, as well as promoting wellness and safety beyond work in our daily lives and in the communities where we operate, makes GSM a stand-out leader in the industry," added Bourbonnais. Gulf Stream Marine is the largest non-union stevedore and marine terminal operator on the Gulf Coast, serving ocean freight carriers, freight forwarders and engineering, procurement and construction contractors in six major ports and several privately owned deep-water marine terminals.